Most telemark skiers worry the most about injuring their knees while earning their turns. The study certainly supports this concern, as the most common injury is to the knee (about 30-35% of all injuries reported). There are basically 2 groups of injuries: sprains and ligament tears. Mild sprains heal rapidly and may involve the medial collateral ligament (MCL). The more significant season-ending injuries are those that involve the MCL and/or the anterior cruciate ligament (ACL). The combination of torsional stress and valgus force on the knee results in the common MCL/ACL injury shown in the animated sequence here on the right. This injury is commonly found when the skier catches the inner edge of a lightly weighted or non-weighted ski. This can occur when the uphill ski—early in the initiation of a turn—is not weighted properly or is flat on the snow instead of being used to carve the early part of the turn. Ooooh, this looks pleasant! How do I avoid it? Both of these injuries have one common feature, they evolve when the rear ski is not properly edged and/or weighted. 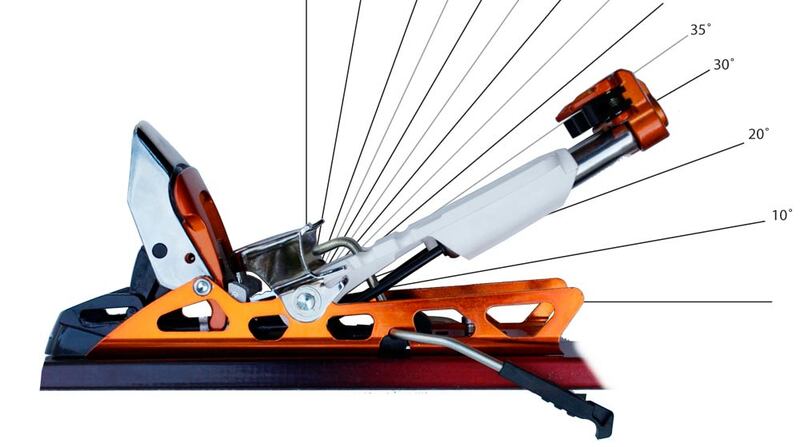 In other words, the inside edge of the rear ski is cutting into the snow instead of the outside edge. In the combined MCL/ACL injury, the front inside edge is caught then the ski is pulled out away from the body and center of balance, twisting the knee using the ski tip as the fulcrum. In the pure ACL injury, the tail of the ski is usually weighted and contacting the snow, and as the skier falls back on to the tail, it pushes the lower leg forward, placing shearing forces across the flexed knee. What training technique can be done to prevent these injuries? The following principles will very likely reduce your risk of injury if you can put them into practice. If you think you are about to fall, avoid falling back on the tail of your skis. Instead, try to fall along the fall line or to the side. 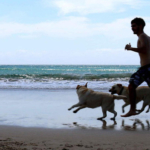 Keeping hands forward will encourage you to fall forward and not sit down on your tails. This will prevent the majority of the forces that cause knee injuries from coming into play. 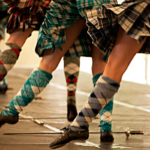 It places the knee in a more stable position (less hyperflexed) and keeps the ankles and hips flexed as well. Unlike alpine skiing, the forward fall is quite a bit safer with a free heel boot. 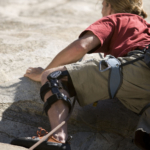 The risk of sustaining a tibial fracture is neglible since the heel will readily lift off the ski and the toe flexes forward easily in tele gear. Keep your weight centered over the both skis with your ankles flexed forward. This positions you to fall forward in the event of a sudden edge catching on the snow- a common cause of injuries at lift areas. Practice edging with your inside (uphill) ski. You learned the stem technique early on and must get used to weighting the rear ski as you cut turns. As you gain more skill in weighting the rear ski (up to a max of 50% of the total between the two skis), you can start the process of learning the use of both skis to edge the turn equally. One exercise to help with this technique is to work on deliberately weighting your inside ski early in the turn, before you turn down the fall line, followed by weighting the downhill ski. [Do this on an easy slope, as it is an exercise that feels very awkward for most at first]. This will cause your inside ski to carve a tighter turn than the downhill ski, causing a slight flare with the tips of your skis. This feels very different from the stem turns that you learn on but forces you to edge, and therefore use, the uphill ski properly in your turn. Ideally, after you have mastered the use of the uphill ski, then you focus less on early turn initiation with the uphill ski and move back to using both skis together. But now, they will be weighted more equally and carve parallel to each other the entire turn. Download MPG video of this technique. Get air. 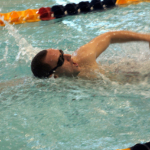 If you unweight well between turns, you are less likely to catch your edge. Again, moderate flexion of the ankles, hips, and knees will allow for a light spring-like effect to unweight both skis when transitioning between turns. Also, once you feel a fall is inevitable, getting your skis out of the snow will keep them from getting caught and taking your knees with them. In other words, when you know you are losing it, pop up out of the snow to lift your feet and edges out of the snow. Though you may feel that you are being asked to take all your falls head on, remember– you need your knees, not your head, to ski. The relative risk of knee ligament injury is significantly lower among skiers with plastic boots. Controlling for experience (skill level) and bindings still showed this was a significant difference. My suspicion is that the greater stability of the plastic boot may prevent inadvertent falls involving the wrong edge of the ski catching the snow (a common mechanism of knee injuries). 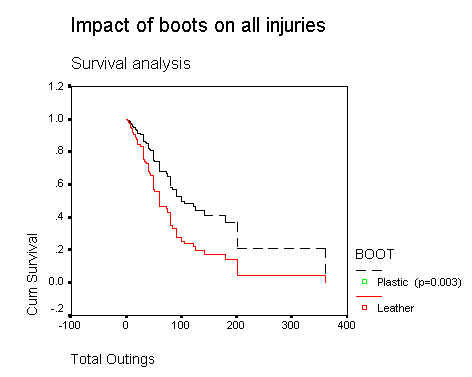 Use of plastic boots was more common in the Expert and Extreme groups (>70%). The use of plastic boot has increased dramatically in the past two years from 38% to 51%. Releasable bindings were used by 11.8% of the skiers, and these skiers had 11% knee injuries in the study groups. 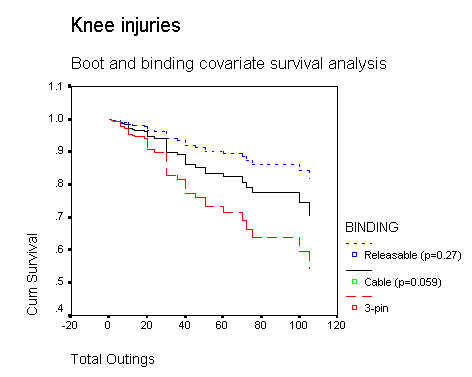 The survival analysis shows a definite trend to lower injury rates with the releasable bindings, though it is not statistically significant (but very close). It seems probable with a larger data set that it would be significant since this trend has been consistent. Releasable bindings, though not fool proof, appear to be a good safety feature consider strongly. The 1997-8 ski season was particularly devastating among backcountry skiers with a higher rate of avalanche fatalities due to several group fatalities this year. The 1998-1999 season continued the trend of more backcountry deaths, particularly among snowboarders near ski areas. The routine use of avalanche beacons in the backcountry has become the standard practice of many skiers in the North America even though incidents involving skiers in this part of the country are quite low. The number of deaths each year due to avalanche among backcountry skiers (not heli-skiers) in the US and Canada is usually less than ten (6 in 1996) and 40 percent occur during high avalanche risk periods. Avoidance of these situations is preferable to the use of beacons as a thin safety net. The beacon can’t dig you out. Beware of the group bravado effect—we tend to take more risk when we ski in a group but it is a false sense of security. Never ski a slope you wouldn’t ski alone. How often do we get hurt? In the past, skiing injuries have be described in terms of thousands skier-days, that is the number of injuries that occur for every 1000 skiers skiing one day each. Though there are different ways to describe the injury rate, this is conceptually one that most of us can relate to well. The overall injury rate is 8.7/1000 skier-days, the vast majority occurring at lift areas. This may seem high compare to alpine skiing whose rate is quoted at 3-4/1000, but up to 60 % of those injuries go unreported to physicians or the ski patrol which is where those numbers came from in most of those studies. In self-reporting alpine skiing studies, the rate of injury is about 9.8/1000 skier-days in the late 70’s but with the decrease in alpine skiing injuries, the real rate is more likely to be 7/1000 based on more recent estimates. Another consideration is comparing injury rates in number of vertical feet skied. The backcountry hut data produced an injury rate that is 1/10 of that of telemarkers as a whole and this is likely do to the amount of vertical feet skied on a average day when comparing backcountry skiing to lift area skiing. Another way of looking at injuries is called Survival Analysis. This is expressed in median number of days to injury or how many days of skiing can we get away with before half of us are injured. This method allows for multivariate analysis of different risk factors and can tell us which are more likely to be significant with relatively smaller numbers. 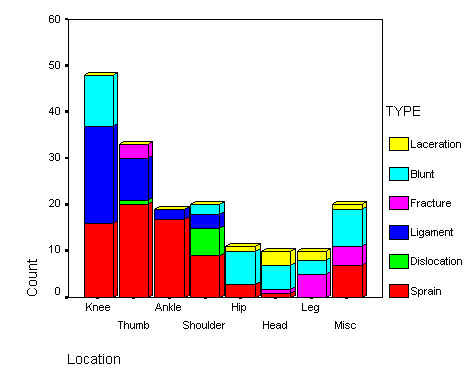 The graph illustrates the percent of injuries sustained in various sites and the type of injury. Sprains of various joints are the most common type of injury and most heal within a month. I have received more reports of lower leg fractures but most of these have been associate with collisions with a fixed object (tree or post), not a boot top fracture that is common in alpine skiers. Thumb injuries have been reported at higher rates than in the past years. Snow conditions during which injuries happen cover the gamut of what skiers experience during the season. The impact of the increase rate of injuries at lift areas is revealed by the high number of injuries sustained skiing on packed powder surfaces. As seen earlier in the study, the injury rate varies with level of experience. Current data shows the following injury rates based on level of skier. Over 50 % of all types of injuries occur in packed powder and crusty conditions according to the respondents. All the more reason to ski backcountry powder. Any snow condition that is predisposed to edges being caught up in a fall are higher risk. Injury risk factors among telemark skiers, Tuggy ML, Ong R. Am J Sports Med. 2000 Jan-Feb; 28(1):83-9. Telemark skiing injuries, Tuggy ML. J Sports Med Phys Fitness. 1996 Sep;36(3):217-22. Risk factors for injuries in alpine skiing, telemark skiing and snowboarding case control study, Sulheim S, Holme I, Rødven A, Ekeland A, Bahr R. Br J Sports Med. 2011 Dec;45(16):1303-9. doi: 10.1136/bjsports-2011-090407. Epub 2011 Nov 15. Telemark skiing injuries: a three-year study, Federiuk CS, Zechnich AD, Vargyas GA. Wilderness Environ Med. 1997 Nov;8(4):204-10.